Brexit has divided Britain into two distinct political camps. You’re either a ‘Remainer’ or you’re a ‘Brexiter’. Rather bizarrely, we have a Tory leader who backed Remain but whose party is driving the UK to Leave the EU and a Labour leader was a Leaver, whose party wishes to remain. Even more bizarre, it is the so-called ‘professional class’ who are mostly Conservative voters (who backed Remain) but voted in the Tories who offered a protest vote in the guise of the EU referendum in the first place. And again, it was the working class who predominantly backed Leave that will be most negatively affected by doing so. Whether you’re a Remainer or a Brexiter – it, as Facebook would say, having themselves been deeply involved in corrupting Britain’s political safeguards – is complicated. The Guardian recently ran a piece about conspiracy theories. 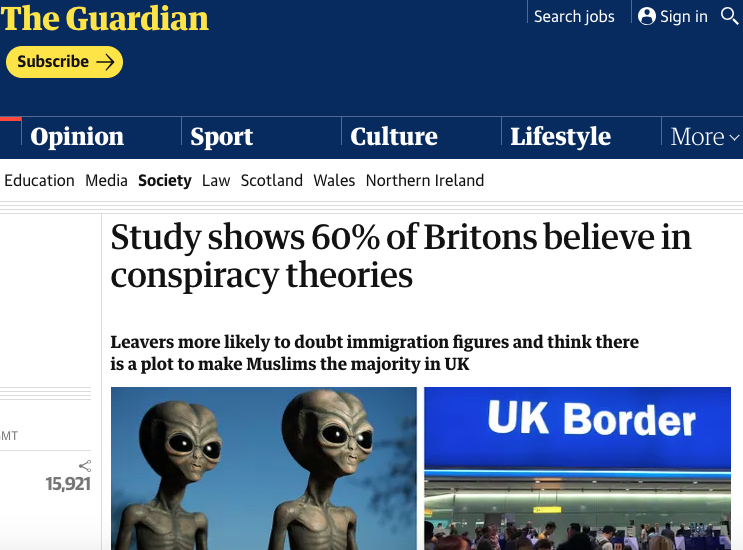 Its headline – “Study shows 60% of Britons believe in conspiracy theories“ is an excellent example of just how divided we have all become and where this is going. Notice the imagery of their article – aliens and the UK border post with the words ‘Leavers’ and ‘conspiracy theories’ laid out so prominently. “Sixty per cent of British people believe at least one conspiracy theory about how the country is run or the veracity of information they have been given, a major new study has found” – The Guardian proudly announces. In Britain, the belief in conspiracy theories is really the result of a corrupted political system. It has led to a deep distrust, not just of authority but of the institutions that uphold society. We all know of the corruption, tax evasion and revolving doors scandals – they are all linked to a growing wariness of our corporate and political leaders and even religious leaders. Conspiracy theories, so the psychoanalysts will tell us, help people make some sense of a very confusing world. Civil society is crumbling, it is falling apart and people are looking for answers. The Guardian is supporting the view that all those that voted Leave are somehow a bit delirious and it is this that is causing so much damage. The Guardian then goes deeper in blaming the spike in racism on Leave voters. So how were the questions framed six years ago that subsequently led the researchers into bundling their various demographic groups into two camps that didn’t exist three years ago? 47% of leave voters in the UK and 44% of Trump voters in the US believe the government is deliberately hiding the truth about how many immigrants are in their country. From there, the article provides some nice little graphs for their readers to look at. They cover; immigration, Islam, anti-vax, global warming, international plots, domestic plots and conspiracy scepticism. All are broken into the new demographic of Brexiters or Remainers – why that is, I can’t seem to fathom. Except to blame all Leavers on any negative result the researchers came up with. Then, another odd statement is made. It is, as if, the researchers did not understand in the first place that the peoples of the democratic west have had their fill of the huge deception that somehow voting in a ‘normal’ democracy means change. It didn’t. So we got Brexit and Trump which does mean change. It doesn’t necessarily mean good change – it means getting rid of the status quo that wasn’t working for the vast majority. Conspiracy theories have been around for a long time. Some of the latest ones are confusing and difficult to understand. From 9/11, the Skripal affair, to global warming and the deep state – all are steeped in suspicion because we no longer believe in our corrupt politicians or their compliant so-called experts and spin merchants. It is not because global warming or those false flag events are true or false, it’s that trust in those supposed to be setting an example – and who should know better, has completely cratered. As for Trump. He is not so much a conspiracy theorist than he is just a born liar and a fantasist. He is merely a pawn of what the state of America wants. Trump is a ‘populist’ style leader. He will do and say anything that suits his temperament and agenda. The same can be said of the Brexit ‘ultras’ – those that peddled their deluded conspiracy theory about Britain being in an economic garden of heaven if it left the evil clutches of our nearest neighbours. The truth is, they had no idea what the problems were going to be, they didn’t care either. Brexit, if anything is nothing more than a theory as there are no facts until they become so. The reality though about conspiracy theories is that successive governments in Britain have truly betrayed the trust of everyone. The biggest scandals of the 21st century in Britain are deeply rooted in a political system where a corporate-driven profit model has directly led to people becoming baffled and bewildered and looking for answers. The death of Dr David Kelly, the phone hacking scandal, MP’s expenses, Windrush, the Facebook/Cambridge Analytica fiasco, Google censorship. Then there’s our awful involvement in Iraq, Syria, Libya and Yemen. Both Labour and the Tories backed each other up on these unjust and illegal attacks on innocent people. So did the corporations that profited from them such as the corporate media, munitions manufacturers, ‘security’ companies and the like. The bloody collapse of Libya – which triggered a refugee crisis in Europe and aided the rise of Isis is the shameful blame of David Cameron’s when he overthrew Colonel Gaddafi. The result was that Cameron went on to use the crisis he caused to stoke up an anti-immigrant sentiment (remember that ‘migrant swarm’ he bleated about) that was then was used as part justification of his disastrous EU referendum decision that also failed. The real conspiracy theory here is that Libya, like Syria, needed our ‘humanitarian’ efforts to avert a disaster. That Iraq had chemical weapons. Another conspiracy theory was that Afghanistan was somehow responsible for 9/11 and it was Bin Laden himself who orchestrated the attack. And then the government struggles to get their farcical handling of the Skripal affair believed. It is of no wonder really. And it is hardly surprising that people are believing more so in conspiracy theories. Politicians and their corporate paymasters have infected the very fabric of civil society with their venomous and divisive poison and lies. The public has trusted politicians in the past and look where that has got us the country right at this moment. The Guardian would do better, reporting facts about the complete failure of the political system, than blaming the general public for something they were largely misinformed about to start with. The political and constitutional crisis Britain finds itself in is the result of not just the rise of fake news and disinformation but because the British press is far from unbiased (the most right-wing in Europe) and owned predominantly by offshore billionaires. If 80% of the public don’t trust their politicians, why would they buy into their vision of the future? They shouldn’t and won’t in future. The result of all this political and diplomatic vandalism the country is now suffering from, will not end well for anyone except a tiny minority who are invested in the chaos that looms large.